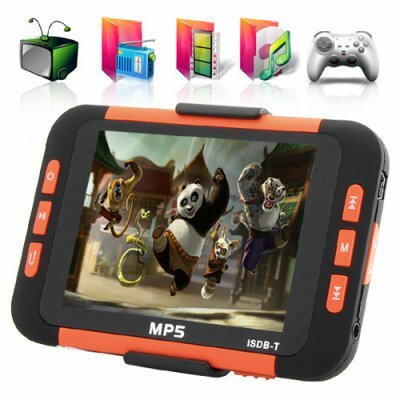 Successfully Added MP6 Player with 3.5 Inch LCD Screen + ISDB-T Digital TV (8GB) to your Shopping Cart. The first ever ISDB-T digital TV MP6 player is here. A true MP6 player supporting VOB and RMVB file formats along with ISDB-T digital TV and all your favorite digital music and video file types. Excellent in design and functionality with a crystal clear 3.5 inch LCD display screen, this is the perfect portable entertainment unit for anyone who enjoys their digital media. This hand held MP6 multimedia player features menus providing effortless functionality, from playing music, watching videos, or enjoying ISDB-T digital TV on the go. This model N09 is designed with a straight and simple navigation menu system making navigating through its internal graphical menu system easy for everyone young or old. It also comes with a standard 3.5mm earphone input, so you can enjoy your entertainment using your favorite pair of high quality earphones. The MP6 portable media player comes with a built in 8GB flash memory, with additional expansion of up to 16GB's using the micro SD card slot. You can also connect your new MP6 multimedia player to your TV using the included AV OUT cable so you can watch your collection of digital media files on your living rooms big screen TV. This MP6 player also comes with a table kick stand, so even when your at work, you can have your multimedia station right next to your monitor while you are working. In addition, the N09 is built with a finely detailed molded casing and polycarb front panel to protect the inner screen, meaning it can be safely carried around in your bag or pack without having to worry about the daily wear and tear you can expect in the busy modern life. A simple and elegant portable multimedia station, this MP6 Player (MP3 + MP4 + MP5 = MP6) plays music, movies, digital TV, ebooks, and more all in one amazing unit - the Chinavasion CVMI-N09. Get yours today at a low factory direct wholesale price from the leader in wholesale electronics, Chinavasion. MP3, MP4, MP5 Player functions in one unit - an MP6 Player! Will his MP6 Player work in North America, Australia or Greece? This digital media player will work fine in every county, however the digital TV function will only work in countries that support ISDB-T like Brazil. Can I recharge the built in battery simply by connecting this digital media player to my computers USB port? Yes you can, nowadays you can charge almost any electronic media player through your computers USB port. In which countries will ISDB-T work?